TAFA, the current American Sport Art Museum and Archives (ASAMA) Sport Artist of the Year, shared the stage with the Prime Minister and First Lady of Malaysia during a gala event at the St. Regis Hotel in New York City on 16 April 2010. 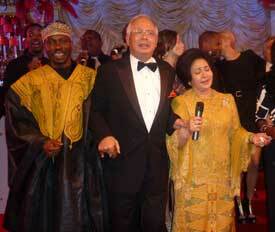 TAFA, Prime Minister Najib and First Lady Rosmah joined renowned singers and actors for a rendition of the song “We are the World” at an event honoring the Malaysian dignitaries which was co-hosted by the Business Council for International Understanding (BCIU) and the United States Sports Academy. Oscar winning actor Jamie Foxx emceed the event, which was also attended by fellow Oscar winners Charlize Theron and Robert De Niro as well as Grammy Award nominee Leona Lewis. First Lady Rosmah accepted the inaugural International Peace and Harmony Award from former Secretary of State Lawrence Eagleberger.